Salt Lake City Plastic Surgeon Reveals Health Benefits of Vitamin C For "Summer Skin"
Dr. J. Gregory Kjar, a Salt Lake City Plastic Surgeon, describes how Vitamin C can provide healthy summer skin. Dr. J. Gregory Kjar and master esthetician Heidi Benson offer an educational seminar on “Summer Skin” and Vitamin C open to the public. 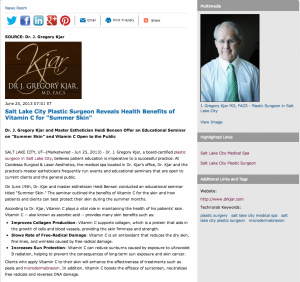 Salt Lake City, UT – Dr. J. Gregory Kjar, a board-certified plastic surgeon in Salt Lake City, believes patient education is imperative to a successful practice. At Candessa Surgical & Laser Aesthetics, the medical spa located in Dr. Kjar’s office, Dr. Kjar and the practice’s master estheticians frequently run events and educational seminars that are open to current clients and the general public. On June 19th, Dr. Kjar and master esthetician Heidi Benson conducted an educational seminar titled “Summer Skin.” The seminar outlined the benefits of Vitamin C for the skin and how patients and clients can best protect their skin during the summer months. Improves Collagen Production: Vitamin C supports collagen, which is a protein that aids in the growth of cells and blood vessels, providing the skin firmness and strength. Slows Rate of Free-Radical Damage: Vitamin C is an antioxidant that reduces the dry skin, fine lines, and wrinkles caused by free radical damage. Increases Sun Protection: Vitamin C can reduce sunburns caused by exposure to ultraviolet B radiation, helping to prevent the consequences of long-term sun exposure and skin cancer. Clients who apply Vitamin C to their skin will enhance the effectiveness of treatments such as peels and microdermabrasion. In addition, Vitamin C boosts the efficacy of sunscreen, neutralizes free radicals and reverses DNA damage. Candessa Anti-Ox Ultra: firms skin, stimulates collagen, enhances retinoid effectiveness, and brightens and smoothes texture while providing free-radical protection with antioxidants. As with every event or seminar run by the practice, Dr. Kjar offered special discounts and giveaways at the “Summer Skin” seminar. Each attendee received a complimentary Candessa SunStop Sunscreen ($43 value) or a Candessa Anti-Ox Ultra Serum ($78 value). In addition, Candessa Surgical & Laser Aesthetics offered a Vitamin C package at a discounted price. For the month of June, Dr. Kjar’s plastic surgery practice will also be offering Vitamin C Brightening Facials. Dr. J. Gregory Kjar earned his medical credentials at the University of Utah, Southeast Michigan’s Providence, and Mt. Carmel and Sinai Hospitals. He is a board-certified plastic surgeon who trained with Dr. Ian Jackson in craniofacial and plastic surgery at the Mayo Clinic in Minnesota. Dr. J. Gregory Kjar is available for interview upon request.